Photo by Universal Pictures - © 2018 Universal Pictures. All Rights Reserved. He’s done it once again. For many spectators, Viggo Mortensen will always be Aragorn from The Lord of the Rings but he did it once again and created a character that’s here to stay. Green Book, set in the early 60s, is about the Italo-American bouncer Tony Lip and the African-American pianist Don Shirley and how they end up on a strange concert odyssey through the deep south of the US. Sounds good? Yes, it does. The film opens with a tracking shot that looks like it’s straight out of Goodfellas and the aspect that stands out straight away from the beginning is the music. Lots of African American classics by Aretha Franklin, Little Richard and the lot create a vivid 60s feeling. Opposed to that is the strictly classical music that Don Shirley likes to play. The music reflects the binary conflicts of the narrative: Black and white, and how they fit together (or not). Viggo Mortensen’s character Tony is introduced as a brutish, narrowminded and utterly simple character. But it is this exact simplicity that makes him incredibly charming. He’s a boy in the shape of a Scorsese character. And he’s all about the food. If you could summarise Tony in one word it’s food. And it’s hilarious, the way Mortensen eats himself through the film is reason enough to see it. While Tony eats, Don drinks and is more intrinsically conflicted which adds more depth to the whole affair. Yet, even though they might appear very different in the beginning, Don and Tony deal with similar subjects: Home, family, racial and cultural identity. Green Book is a simple film. And it is brilliant at being so. There is a balanced mix of humour, illustrated by the various scenes involving food but it also greatly lives from the chemistry of the protagonist duo. Don’s need for order and manners clashes with Tony, well, because that’s just not the way how Tony works, and it creates great moments of silent comedy expressed through mimicry only. While it is a comical movie at times, it certainly also seeks to draw attention to racial issues in the US. Tony and Don encounter fierce verbal, physical and institutional racism along the way, mostly directed towards Don. The numerous instances where Don is not served in a shop, bar or restaurant illustrate the ridiculousness of racism and also remind us to keep in mind that racism is still a prominent problem in our society. 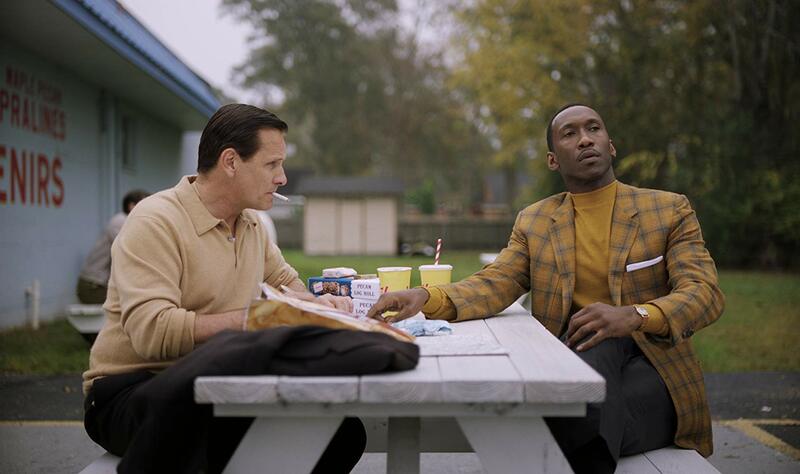 Green Book certainly stages such conflicts; however, it merely scratches a surface and doesn’t go into any kind of depth regarding questions of race. As a consequence, the film can feel quite tame at times. But maybe that’s not a minus. There are numerous occasions where the narrative could turn into a dark piece about race but it never does. So, maybe a certain indecision towards a final rating might be because in this day and age, with films like Detroit or Straight Outta Compton that highlight the brutal realities of racism, one almost expects things to go bad. Regarding race, films have moved away from romantic stories and happy ends, which might be the exact reason why Green Book is perfectly fine just the way it is. Because it breaks the pattern and reminds us that narratives about race do not always have to be brutal, that there are exceptions to the rule, that not all people are racist. Maybe it’s exactly the film we need right now to remind us of the simple and good in life. Because that’s what the film is; simply good. No extravagant montage or effects, a simple story, a bit of humour and a pinch of drama. A light-hearted watch with brilliant performances by the unlike duo. Love the review, and I felt similar watching it. I think the fact it doesn’t delve into a dark, brutal story about race as you put it can make it just as effective as a heavy drama. Here we see the quiet (and sometimes not so quiet) everyday racism that a huge proportion of people had to bear.